It’s difficult to say where the sanctions will lead. My feeling is that Iran will take the pain. They will dig in and hope that Trump is not re-elected. Sanctions are certainly in fashion at the moment, although they rarely produce the desired (or at least the stated) goal. I can’t help but think that the leadership of some Western countries projects it’s own modes of behavior onto other countries. For example, I have a friend, a very smart businessman, who predicted that Russia would back down on Crimea after the United States and its European partners hurt Russia economically. This friend comes from an affluent Western European country known for being pragmatic when it comes to money. I told him I did not think that sanctions, however harsh, would affect policy, that Crimea and Ukraine were matters of principle for the Russian government. He was projecting his own attitude toward financial security onto the issue. If American economic growth dips a fraction of a percentage point, it can produce panic. But Iranians, and Russians for that matter, live in another world. I do not mean to say that either is not suffering because of sanctions. Of course, they – we – want normalized economic relations, material comforts, etc.. But we’re more inured to instability. So I have my doubts that the Iranians will back down, that they will respond according to the American calculus – to the tactics that Trump perfected dealing not with Iranians but with New York real estate moguls. 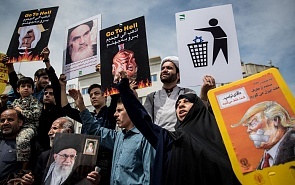 The Iranians may, in fact – perhaps contrary to logic – become even less willing to negotiate as the situation in Iran worsens. On a cynical note, I have to wonder whether the Iranian refusal to negotiate really is a problem for some hawks and business interests in the bloc pushing sanctions. There are benefits, after all, to blocking a competitor from selling his product. The Saudis will not be complaining about the lack of Iranian oil on international markets. In that sense, Iranian intransigence is good for business. But in general, it’s hard to predict what will happen in Iran. Remember that even on the eve of the 1979 Islamic Revolution, neither the CIA nor the KGB expected the shah to be overthrown. Up until the last minute, agents and observers were filing reports that the government would hold. I'd like to reemphasize that the use of sanctions against countries wholesale is morally suspect - because it's the population that takes the hardest hit, not the leaders. Anyone would become convinced of this who knew people in those countries, people who have trouble feeding their families because a stronger power is trying to cripple them economically - often for votes and economic gain back at home, despite the talk of high principles. And all under the premise of: if you are starving, you will overthrow X government that we do not like. With Iran this kind of maneuver is nothing less than a tragicomic, absurd cycle: We overthrow the leader we don’t like and then install one we do like, until you get so fed up that you overthrow him, and then we punish you again, and then you rise up again, and then... Remember, sanctions were also imposed against Iran under Mosaddegh back in the 1950s. What about the larger historical context of Iran’s relationship with the US? The history of US-Iran relations has deep roots entangled with colonialism. Much of the trouble with Iran - which was once a close ally to the US, like Saudi Arabia today - is that oil was discovered in Iran too early, several decades before it was found in Saudi Arabia. Oil was discovered in Iran during the end of the colonial age, in the early 20th century, when Britain essentially told the rest of the world what to do. It wasn't until after World War II that the US struck their big oil deal with Saudis, and by then the world was very different: the British Empire was a memory. And the US did an amazing thing: it agreed to give the Saudis a 50/50 split of proceeds. By the way, I would argue that this decision is one of the big reasons that despite so many differences, the US-Saudi alliance still holds. It laid a strong foundation. The British, on the other hand, continued taking almost all the proceeds from Iranian oil, and after the war, when circumstances in the world had radically changed, the British still would not readjust, they wouldn't back down. The Iranians were not even allowed to look at the accounting books. But the Iranians were getting more curious about those books, especially when they saw what a good deal the Saudis got with the US. From the English perspective, if you've struck an advantageous deal with a dictator, the last thing you want is a democracy that will reconsider that deal. So, wrong followed wrong, and the British did everything they could to stifle any kind of democratic decision making from developing in Iran. The US resisted the British policy at first, but Churchill cleverly got the Americans onboard – playing the communist card, that Mosaddegh was really a communist. Now the Americans were also partners in crime, so to speak (and looking at a handsome financial windfall if they could get a hand in Iran and Iranian oil). So, there followed the CIA-orchestrated overthrow Mosaddegh and support for a more cooperative authoritarian government in Iran. Tensions grew for decades, finally erupting in 1979, when the US and Britain, after all their machinations, lost Iran completely. In a way, the Iranians are still to this day being made to pay for the arrogance of demanding a fair deal back then. Of course, there are other concrete issues – Yemen, Lebanon, etc., but I often wonder whether much of the antagonism is not an accident of historical timing that laid a poisonous “colonialist” foundation for Iranian-British and then Iranian-US relations.